If SEO was the DeLorean in Back to the Future, the flux capacitor would be the keywords — the device that makes time travel possible. And we’d need to reach 88 miles per hour to activate the flux capacitor. It’s the exact same scenario with keywords. Should you choose the wrong keywords, very rarely will it just happen that your site will gain enough speed to obtain rankings and pull in traffic. To help us out in our time-travel endeavors, the big search engines and a few other players have provided us with free keyword tools. Not all work well. Not all are useful. Even the best can’t provide exact data for the here and now. Just like the Doc’s DeLorean, we know what we see is from a previous point in time. I hopped in the DeLorean with Marty McFly and set the dial to 2008. We went back to when Yahoo! killed the Overture Keyword Tool. A traditional suggestion tool was then rolled into sponsored search as a built-in tool. Obviously with the merger, we shouldn’t expect to see anything new. Yahoo! 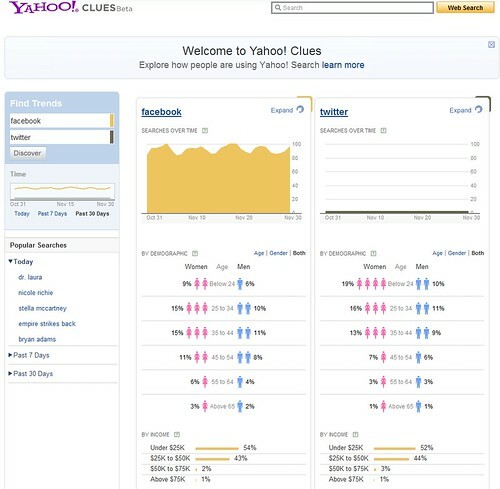 Clues is a fun tool that is similar to Google Trends mashed up with Google Insight. The data is displayed as a 100-point scale, which simply means “0” represents the lowest amount of searches and “100” would represent the highest. Not many people know about the Microsoft Advertising Intelligence Excel add-on. This bad boy is an add-on for excel. Although the proprietary Microsoft-only compatible tool may rile up some open source fans, the author thinks it is handy to have the data compiled directly in a spreadsheet. No comma separated values, amen! It features bid pricing, keyword history, keyword forecasting, demographic and geographic filtering, gathers data by verticals and more. For better more in-depth tips on this tool see Tina Kelleher’s post on the Microsoft Advertising blog. This is the industry leader. 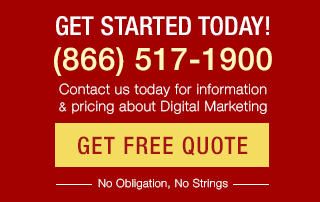 The majority of what we do is specifically done for Google. For that reason, we were elated to hear the AdWords Keyword Tool no longer includes data from Google’s content network. Before this, the volume data was said to be severely inflated and inaccurate. In the Google AdWords tool, we see suggestions, traffic estimates (globally and locally), search by geographic location, languages and sort filters built right in. We can also combine keywords found in our search query reports in analytics, AdWords and Webmaster Tools to gather a more robust keyword list. It’s a good idea to stack these figures up against the Wordtracker tool. 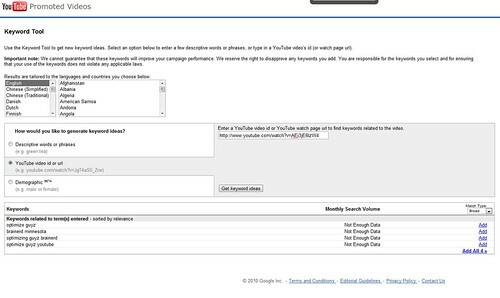 The YouTube keyword tool is a great keyword tool to assess demand levels on YouTube. The suggestion feature definitely needs work, but as with all other keyword tools, one can identify flagship keywords where there will be consistent searches. Also search by demographics and search by video. The video search is really handy when assessing whether or not a video has been optimized for keywords that are popular enough on YouTube. WordStream offers five different tools all related to keywords. Which are worth using depends on your goals. At Optimize Guyz, when we are scanning for relevant blogs, the Suggestion Tool is something that brings us a lot of value. It is one of the most comprehensive suggestion tools available. The Keyword Grouper tool is very effective for PPC ad compilation. Wordstream does not provide exact volumes, however. Data is represented as a ‘frequency’ and not in actual number of searches. Wordtracker is the most similar to the AdWords Keyword tool, therefore, it is what we use to cross-reference our findings. It provides relevant searches and total number of searches. The last time I heard where Wordtracker was obtaining data was from Meta crawlers. The keyword suggestion service by Wordtracker is a handy-dandy tool that we use for article creation. 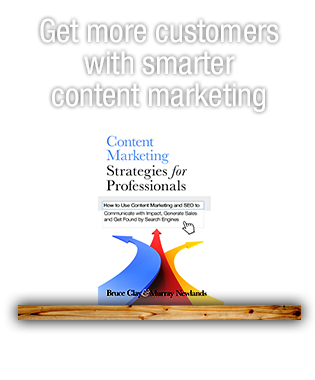 We look for keyword phrases that are consistently queried and try to write articles on topics that don’t have a lot of existing answers on the Web. It should be mentioned that both WordStream and Wordtracker have excellent resources on their sites and blogs as well. I highly recommend you connect with both on Twitter: @WordStream and @Wordtracker. With the growing popularity of social media sites, it seems like a keyword strategy guide would be incomplete without mentioning a few tips regarding keywords research on Facebook and Twitter. Of course there are many premium tools like Trackur, Lithium Technologies and Alterian. Prices range from $100 into the thousands per month. The main difference between keyword tools between social media and organic search is the need to track (as close to real time as possible) social mentions of brands, products and services. Not only that, gathering data on a large scale can also help companies identify patterns and adjust their marketing campaigns accordingly. As insights from Facebook continue to improve, we should be seeing a lot more social media keyword software available soon. As far as I know, any free versions of social media tracking tools like Social Mention now still rely on the mentions hitting the Google or Bing index first. As more APIs become available, it may be something smaller to mid-level businesses can realistically start using sometime soon. If you are interested in formulating a keyword strategy for social media, visit WordStream’s social media keyword research guide. One thing that is worth repeating, something we frequently hear in forums, is new site owners become frustrated and even enraged when they go after a keyword that Google’s keyword tool showed 300 searches for last month. Remember, unless you switch your settings from “broad” to “exact,” your data includes every possible combination of that keyword. Also, even the No. 1 ranking site (in organic search) will only see a percentage of the actual monthly searches. For more keyword tools, visit my keyword summary on Squidoo. Brent Rangen – Brent is owner of the Optimize Guyz, a full-service SEO agency, and has been working on the cutting-edge of SEO since 2001. He’s also worked extensively in the travel and hospitality industries, consistently producing results in the companies that he partners with. Always striving to make the SEO community better, Brent can be found helping users in SEO forums around the Web. Get in touch with him on Twitter @BrentRangen. Thanks for mentioning Lithium Social Media Monitoring (formerly Scout Labs) here! I love our reporting feature that adds up all of the frequent words that appear in your social media mentions. Good SEO insights in there! Both Google Trends & Insights will also let you dial down to the UK, even specific regions. A note to everyone else, Aaron Wall just published a great post on Google’s Global Market Finder tool: http://www.seobook.com/googles-keyword-tools-keep-getting-better. Why should I? Because you need to know if you have potential to sell in other regions as well. 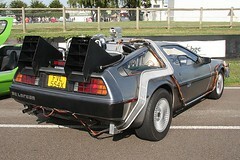 As a child of the 80’s I love your anology of the DeLorean, very cute! Any suggestions for a suitable tool like Yahoo for us guys on the other side of the pond? 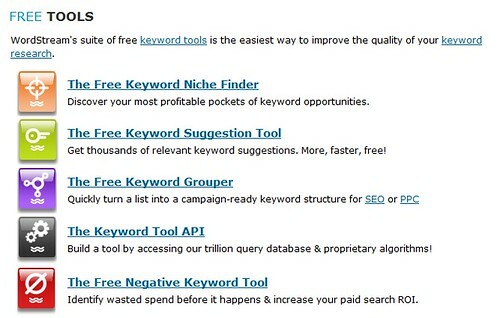 Thanks for posting this excellent list of keyword tools. Since I already use Google Adwords, Yahoo! Clues and the You Tube keyword tool are especially interesting alternatives. Every tool shows somewhat different results so it is a good idea to extract results from several sources. 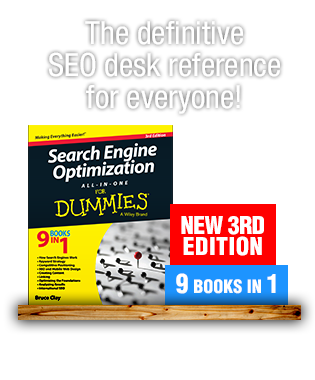 It is kind of a hodge-podge of some of the keyword tools we use on a regular basis. As my Small Biz article states, we also use Market Samurai & now Keyword Elite 2 as well. It can be frustrating though seeing inconsistencies through data coming in over the API’s. @Andy, Yes, the discovery phase is one of the most difficult. I don’t think any KW tool alone will ever be able to find all relevant keywords. It is nice though to find consistencies and trends within a vertical. Nice list. Wordstream has some nice tools I hadn’t tried out yet, and I’m liking the niche finder and negative keyword tool. Will be a nice addition to the toolkit, thanks! Kudos on the article Brent. I can’t wait to implement the new flux capacitor to target keywords for my new niche website. Didn’t know about Yahoo! Clues before this post and I’m looking forward to testing it out.